1.5bn apps downloaded from the App Store. 100,000 developers signed up for the iPhone Developer Program. The Palm Pre? It won a lot of acclaim but it’s nowhere near the iPhone when it comes to consumer demand, it clearly faces about as big a challenge as could be imagined. Sales of the phone may already be slowing and despite an attractive app store of its own, the respectable 1m app download mark that was hit just 18 days after the Pre’s launch pales in comparison to Apple’s numbers. Nokia? I haven’t heard anything about the Ovi Store since its shaky launch. RIM and Microsoft? They’ve got a long way to go too. Right now, the game is Apple’s to lose. And it could lose it. Developers aren’t without complaints and most of them aren’t making big bucks. 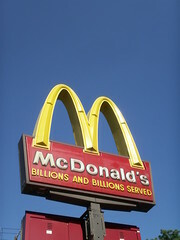 But so long as Apple is the McDonald’s of mobile apps, developers will go where the meat is. Photo credit: Daquella manera via Flickr. Did faulty servers kill Friendster? Discussions of Friendster may sound like ghosts from social networking’s past, but the site’s founder Jonathan Abrams is back in the news today, telling the LA Times today that Friendster got too big too fast, and attributes his company’s downfall to poor functionality resulting from exponential growth. While dependability is key to a website’s success, Abrams is still missing the big picture on what makes social networks stick around online.